Our Aruba cruise port guide gives you great information on your ship's docking location, your transportation options and ideas on what to see and do. Welcome to the Aruba cruise port guide. Aruba is one of the most popular islands in the Caribbean. It offers everything you look for while on vacation, whether you would like to enjoy Aruba’s popular Palm beach, go shopping in its Oranjestad or visit one of the many natural formations. Aruba offers a large variety of sites and activities to cater any tourist. The island is covered by dry landscapes, cactus, boulder formation and is home to one of the best beaches of the world. 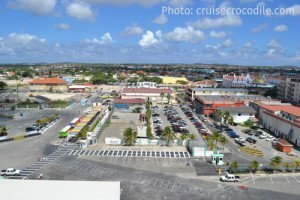 Cruise ships arrive in Oranjestad. This is the capital city of Aruba. Its colourful small city centre is close to the terminal and best to explore by foot. Find more details about the cruise terminal underneath. This will be your view from the ship when you are docked. You’ll be able to look out over Oranjestad. In front of the cruise terminal you will find a large parking facility with tour busses, taxi stand and a car rental. Across the main street you will also find public busses. Across the island you will find many amazing beaches dotted with luxurious hotels and nice bars! Cruise ships dock at the Aruba Port Authority. At the port of Aruba you will find 2 modern cruise terminals. Check where your ship is going to dock on the following link: http://www.arubaports.com/main/cruiseship-schedules/. Cruise ships can dock at berth B,C, F and G. All of them are close together. See map above for the details. At the terminals you will find souvenir shops, tourist information, arms, car rental and free streetcar. From the cruise terminal it is about 1 km or 10 minutes walk to the city centre of Oranjestad. Public Bus Across the cruise terminal on L.G. Smith Boulevard is where you will find the public bus station. The bus service is pretty extensive and it is suitable to take to one of Aruba’s beaches for example. The round-fare is 2,30 dollar. One way is 1,30 dollar. Have exact change with you to pay for the bus. Taxis in Aruba Taxis don’t have a meter. Every driver should have an official rate table established by the government. From cruise terminal to Palm beach is about 11 dollar, to Eagle beach 10 dollar, to Donkey Sanctuary 19 dollar, Ostrich farm 23 dollar. A taxi cost 45 dollar per hour for a maximum of 5 guests. ATM There is an ATM in the terminal that can give you Guilders (local currency) or US dollars. Wi-fi Find the kiosk of Setar N.V. at the Cruise Terminal to buy your phone and internet cards here. Aruba’s free streetcar Right outside the cruise port’s main gate you will find a free streetcar that takes you to the main street area. The trolley comes by ever 25 minutes between 10 am and 5 pm. Rent a car You will find the Royal Car Rental and Smart Rent a Car office just outside the cruise terminal. Make a reservation ahead of time to guarantee availability. See map above for their exact location. Shopping The terminal is close to the city centre of Oranjestad. When exiting the terminal you go right at the main road. This is where the shopping district starts and you will come across more and more stores the closer you get to the city centre of Oranjestad. This is the Aruba cruise dock. 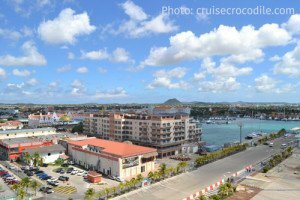 The dock is located in Oranjestad which is the main city on the island. You’ll dock withing walking distance of the city center. 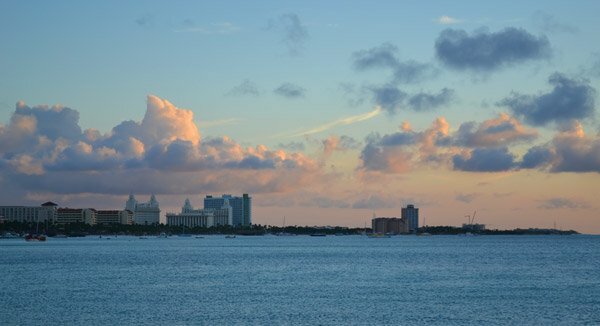 Read all about your options on what to see and do in our Aruba cruise port guide.